Tow rope is generally used for towing vehicles, boats. These are also used for some extreme water-sports like wakeboarding and water-skiing. However, recovery ropes are quite different from surfing ropes as they are heavier and designed for towing heavy loads. If you have a car or truck, a tow rope is a must have accessory in your toolbox as your vehicle can break down anywhere, and towing might be necessary. Also, if you live in an area with heavy snowfall then you must know the importance of a recovery strap. You can find these ropes at local hardware stores or some popular e-commerce sites. The tow ropes come with quality and durability. 2 What Are Top 5 Tow Rope Reviews in 2019? Why do you need a tow rope? How much load will have to be carried? How long should the tow rope be for your purpose? Should there be handles or hooks attached to the tow rope? Is the rope designed for heavy-duty applications? Will you be using the tow rope for towing water boats? Is the rope UV or weather proof? Do you need a tow rope for water-sports? If so, what type of sport will you participate in? What Are Top 5 Tow Rope Reviews in 2019? 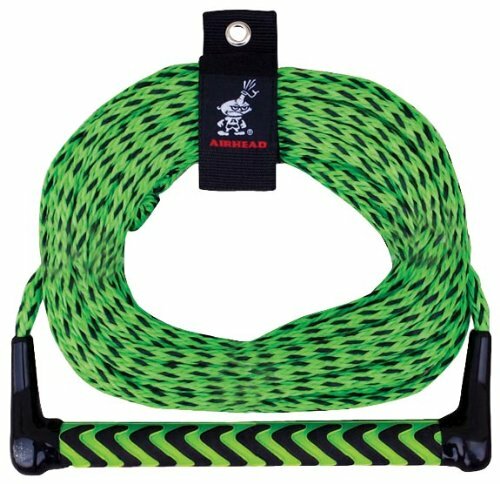 Let’s take a quick look at the short reviews of 5 ultimate tow ropes available in the market. 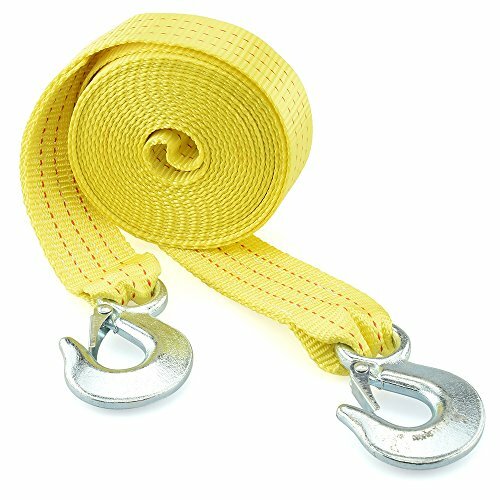 Neiko 51005A Tow Strap is a strong and durable tow rope in a very affordable price. It’s around 20 ft long and 2 inches wide. It’s constructed from premium polyester webbing that offers optimum strength and more consistent force for pulling. 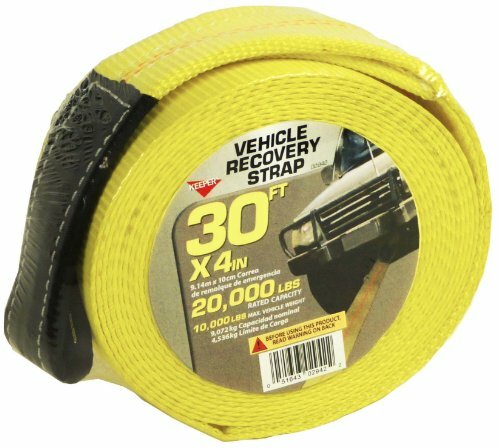 The bright yellow tow strap is weather-resistant and works well in all climates. It won’t shrink, stretch or rot even when used in wet areas. 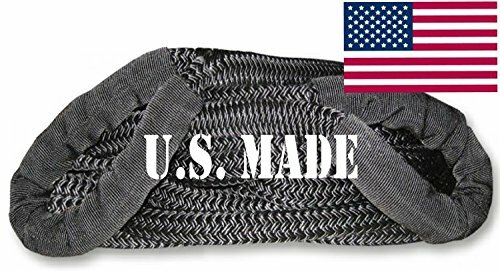 The unique woven pattern adds durability and protects the edges of the rope from wear off and abrasion so that the material will last longer. 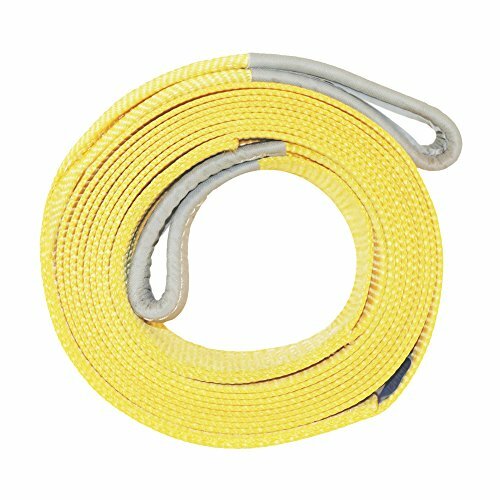 This Neiko tow rope comes with metal hooks that have been drop forged and meticulously heat treated for heavy duty applications. The hooks have safety buckles for easy hook up and extra secure towing. With breaking strength of 10,000 lbs, this is the tow rope for ATV and other small recreational vehicles. This military-grade tow rope from BILLET has been designed for extreme-duty snatching and tugging of heavy duty vehicles that are stuck in mud, sand or snow. The grey tow rope is 30 ft long and 4 inches wide. It’s of highest quality, engineered for heavy duty applications. With breaking strength of 31,500 lbs, it’s recommend for all medium to full-sized jeeps and 4 x 4 vehicles. This BILLET kinetic recovery strap is constructed from double-braid nylon that offers highest strength and stretch for better towing experience. The rope uses kinetic principles for extreme effect and can pull the largest vehicles to safety. This tow rope is mostly used by U.S fire department and armed forces for off-road kinetic recovery. Although the rope is more expensive than other options, its quality and strength is also superior. 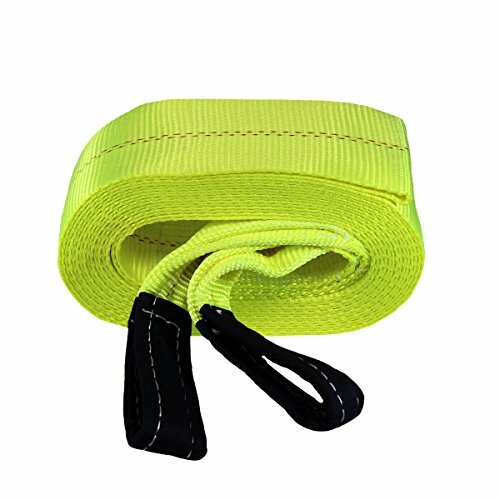 In case you need a heavy duty tow rope for full-sized pickup vehicles then this exceptional tow strap made with tightly woven high quality polyester material is an ultimate choice for you. 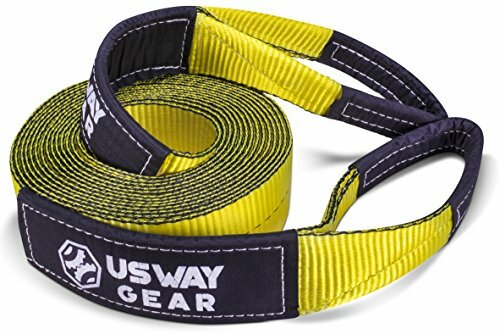 The yellow tow strap is constructed with double loop design for easy towing and has a length of 30 ft to maintain distance and prevent collision during towing. With 30,000 lbs or 15 ton breaking capacity, this is one of the tow ropes for trucks and almost all automobiles. The strap has an additional sewing on its ends, making it extra long while maintaining significantly low weight. The moisture resistant fabric can prevent frost damage up to approximately -40° C. This tow rope is designed to meet the globally rated and highest performance standards at a very affordable price. It will offer extraordinary durability in the long run. 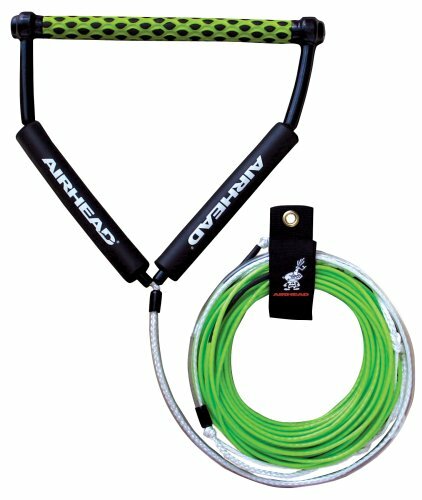 With more than 2,375 lbs of breaking capacity, the Airhead AHTR-22 Tube Rope is the best choice if you are looking for a tow rope for tubing. The rope can be set to 50 or 60 ft depending on the water conditions. It has been designed for maximum two riders. This tube rope is made from low-stretch nylon material that gives excellent and smooth tubing experience. 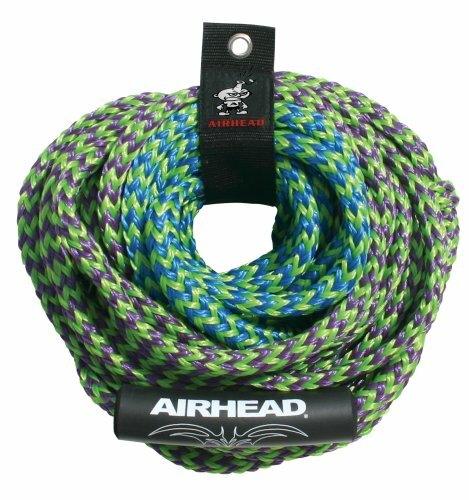 This tow rope from Airhead is UV resistant and its longevity won’t be affected by the harmful rays of sun. At a very reasonable rate the tube rope has all the high precision features that make it superior when compared to other ropes of same capacity. 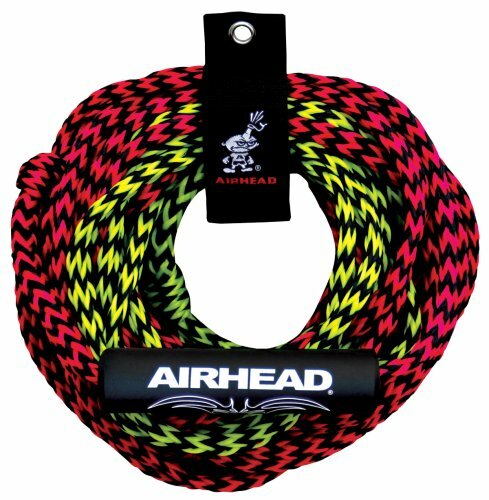 Airhead Kwik Tek AHWR-4 is a high precision tow rope specially designed for wakeboarding. The rope is 70 ft long and can bear up to 2000 lbs. It’s made from top grade spectra material that provides zero stretch for remarkable wakeboarding experience. The thermal-coated spectra rope is rigid and tough and won’t kink or twist unlike other non-coated ropes. It has 15 inches wide EVA handle with full length PVC tubing that provides excellent grip and added durability. As the material is extremely lightweight, it’ll float on the water, making it convenient for riders. In case you don’t have enough time to research each tow rope thoroughly, here is a comparison table of the best 10 tow ropes that has been created based on the product size, capacity and other important aspects. Tow rope is available in different shapes and sizes. It depends on what type of rope you need for your application. Due to numerous choices, buyers often get confused and end up purchasing the wrong item. However, if you consider some important factors while buying the rope, you’ll be able to choose the best tow cable that perfectly suits your requirement. This type of rope is made from a material called spectra. The no-stretch tow rope is extremely strong and durable. This type of tow ropes have no elasticity and won’t stretch at all. The no-stretch tow rope is ideal for water-sport like wakeboarding. Some vehicle tow rope is also made of spectra. Spectra rope has extremely low moisture absorption quality, making it ideal for water and snow. These ropes are 10 times stronger than steel and super-lightweight. The low-stretch tow rope is usually made from nylon, polyester or polyethylene. This type of ropes has elasticity of 2 to 3 percent and is beneficial for novice recreational riders. Also, for towing boats and automobiles the low-stretch rope works well as the rope helps to absorb shock while towing. This type of rope is also water proof. Again, when the three materials are compared, nylon has higher break strength, while polyethylene is constructed from naturally occurring UV resistant materials, and offers better durability. Length is not of much concern if you are buying a vehicle towing rope. However, if you need a tow rope for recreational activities like tubing or wakeboarding, you must choose the right length. For example, if you are a beginner, the length of rope for wakeboarding must be around 65 ft and also for tubing, it should be minimum 50 ft, and must not exceed 65 ft. For other water-sports the length of the rope varies. When you are buying a vehicle tow rope or recreational tow rope, the capacity of the rope is a must consider factor. The capacity of recovery strap is also called the breaking capacity, which is measured in pounds. You must first know the weight of your vehicle or boat for which you’ll be using the tow rope and pick a strap that has more capacity than that. In case you are purchasing a wakeboarding or tubing rope, you must choose the rope with certain capacity according to the liable number of riders. It’s no use picking a rope that has capacity of 2 or 3 riders if only an individual is going to use it, as that will only make it heavier for the user. These days most of the tow rope is designed waterproof so that they won’t absorb water when used in wet areas. Many high quality tow rope is also weather-resistant and UV-proof so that they last longer and won’t easily rot. While some ropes are already made of top grade materials that are naturally featured with these qualities, you can also find many tow ropes that are specially coated with some UV resistant adhesive. This coating not only enhances the strength and durability of the rope material, but also prevents it from tangling. It’s highly recommended to buy a tow rope which is anti-UV or weatherproof if you want your tow rope to last throughout the long run. A tow rope with a good hook is much better if you need a vehicle recovery strap, if you don’t want to add any extra expense in purchasing additional hook for the tow rope. Make sure that the hook is big enough. Even if you may have the best gloves for tow rope, with wakeboarding or water skiing, it won’t be easy to hold if the handle of the tow rope is not of accurate size. Choose the diameter of the handle according to your hand size. At first you may think that buying a tow rope is as simple as choosing the length and hooking it up. But after looking at so many different types of tow rope models you can totally get confused. However, once you get familiar to the differences and get to know your requirement, you can easily choose the right one. We now have a new type of Kinetic Energy Recovery Rope,name is PU Coating Kinetic Energy Rope .You will need it ,because this product is very wearable, cost-effective. I believe it will bring you a high interest. We Qingdao Pangu Rope Cable company is a company with rich experience of the ropes. we have more than 20 kinds of rope products which get patent.We mainly produce Winch Rope,Tow Rope,Winch for 4X4 ,soft shackles. If you are interested in,I’ll send you our samples. I have always preferred a tow strap that does not have hooks on the end. The hooks or the rope where it meets the hook is always the week point and fails in the middle of towing at the worst time possible. I have also seen the damage done and people hurt from flying hooks. Please be safe and remember that even the factory tow hooks bolted to your 4X4 are not the strongest and can become flying objects.